DOGS ACCEPTED - 35 LBS. MAX. - NEEDS TO BE DISCUSSED WITH OWNER IN ADVANCE; ONE PET PER GROUP. Over 4,000Sq.Ft. of Living Space Spanning Four levels, perched on the Side of a Mountain, Striking Views of the Valley below and surrounding Mountains. 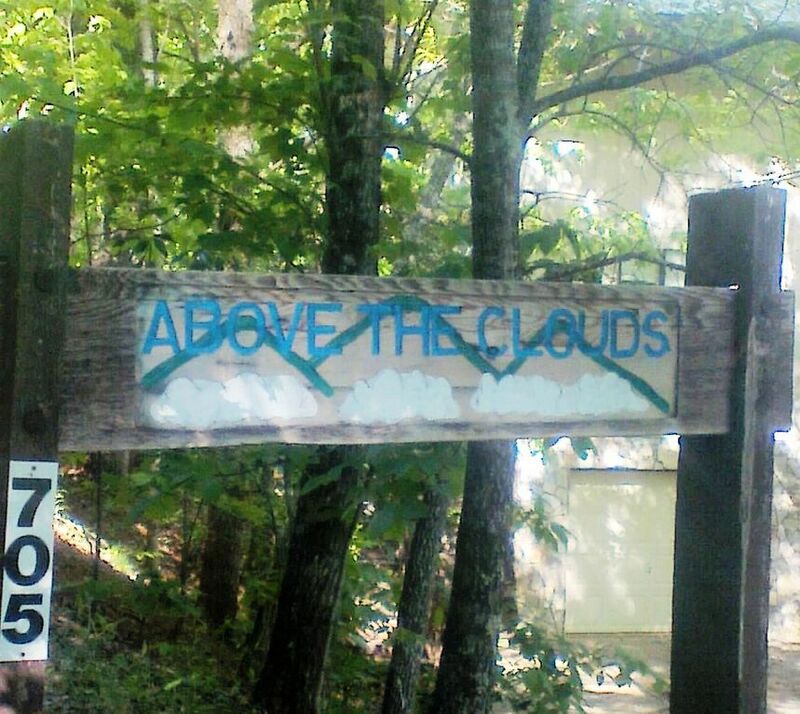 ABOVE THE CLOUDS is a very unusual Property in Franklin , N.C. , from what we have been told, no one can remember another Property having Four (4) Levels perched on the side of a Mountain in this area. A Total of Five (5) Bedrooms, Four (4) Full Bathrooms, counting the Terraces the Home has well over 4,000Sq.Ft. of space. Log Burning, Rock Fireplace in the Main Living Room Two Levels High +/- 20Ft. Wood Burning Stove Lower Suite. House has Central Heat, Mini-Split HVAC at all Levels, and Heated Floors in the Main Living Area and Kitchen. The Views are Stunning!!!!!!...... you are literally perched on the side of the Mountain, at an Elevation of +/- 3,500Ft, see the surrounding Mountains 360Degrees around, and the Valley below. At the Base of the Mountain on Highlands Road, make left an go through the National Forest, incredible Large Waterfalls to look from Roadside, Gem Shops, and Mining available along the way. Scaly Mountain located between Sky Valley Georgia and Highlands North Carolina (+/-30Min. from the Property), The Scaly Mountain Outdoor Center is the place to enjoy both summer and winter fun. Trout Fishing in NC, ice skating, summer and snow Tubing in NC, and they have a Bungee Trampoline. The Roads are paved to the House. At the Property, there is an Upper and Lower Drive , the approaches are hard packed Gravel leading to Concrete Slabs. Great Home on 2.89 Acres of Wooded Land , you will not be disappointed. Excellent Family retreat for enjoying Quality time away from the City ........Make this your Second Home. DOGS ACCEPTED - 35 LBS. MAX. - NEEDS TO BE DISCUSSED WITH OWNER IN ADVANCE. The Property lends itself for large Groups. With Four (4) Levels, everyone can enjoy their privacy, while still being able to come together in the Grand Room (Living Room) and Eleven (11) People can comfortably sit, while enjoying the views, and a Twenty (20) Ft. High Wood Burning Fireplace. In addition to the uniqueness of the House..... We provide an expanded Direct T.V. Channel Package with over +225 Channels of Programming, a true High Speed DSL Line, unlimited Long Distance Calling within the U.S. and Canada as Cellular Service is not reliable here, furnish the Fire-Wood, provide the LP Gas for the B.B.Q., and provide Basic Paper products and Spices to get you started. We also have on Stand-By, Staff close-by, to respond to any questions you may have or address simple maintenance items while you are with us. STUNNING VIEW OF THE VALLEY BELOW AND SURROUNDING MOUNTAINS WITH PRIVATE WALKING TRAILS LEADING TO WATERFALLS. LOCAL & LONG DISTANCE CALLS ARE UNLIMITED. GOURMET KITCHEN, FULLY STOCKED, GRANITE COUNTERTOPS, APPLIANCES, POTS, PANS, DOUBLE SINK, UTENSILS, PLATES, SILVERWARE, ETC...ETC. PROPERTY IS WHEELCHAIR ACCESSIBLE AT THE MAIN LIVING LEVEL WHICH HAS TWO BEDROOMS, ONE WITH TWO SINGLE BEDS, THE SECOND HAS TWO SINGLE BEDS. PERSON WILL NEED TO HAVE ASSISTANCE TO CROSS DOOR THRESHOLDS. Unlimited Long Distance Calls Continental U.S. & Canada, Included. Enclosed Garage Excellent for Motorcycles. DOGS ACCEPTED - 35 LBS. MAX. - NEEDS TO BE DISCUSSED WITH OWNER IN ADVANCE. Had a great time, and we'll be back! We enjoyed our stay at Above the Clouds very much! There was plenty of room, the kids enjoyed the hot tub, and the price was right. My three boys especially enjoyed having the loft as their personal space, and when it rained, they were able to watch movies and play video games up there until it stopped. April was very nice and easy to reach at any time, and the cabin is not too far from civilization. We hope to stay again sometime. Had a great time here. View was spectacular. Different every morning. Would definitely come back again. We have enjoyed a number of places in the past few years, but Above the Clouds is probably the best place we have stayed yet. The home was well kept and clean. The beds were comfortable and rooms spacious enough. We were quite pleased with the master bed and had no issues sleeping. The separate basement suite worked really well for our situation. The home was quite spacious and there was plenty of room for everyone to spread out. Lows were in the 30s while we were there and we really enjoyed the heated floor on the main level as well as the fireplace. The view from the deck was beautiful and in warmer weather would make a great place to relax/eat. I would definitely recommend this as a great place to stay. Beautiful view of the mountains and valley. Nice place to hub to visit several quaint towns! Lots of space with updated and fully-stocked kitchen. Lots of beds and baths. Some beds need new mattresses. Master suite is excellent! Nice location for family reunion or group getaway! Drive up to cabin is not for the faint of heart. Loved it! Owners were very responsive! Wonderful place with unbelievable views. In close proximity to a lot of different activities like hiking, gem mining, and shopping in Highlands. The hot tub was a perfect end to each night. Would definitely recommend. This house has amazing views. You are literally in the clouds. It is about 3,000 feet in elevation. The house has 4 levels with 3 decks. The upper 2 decks are gated so if you bring Fido along, he can't wander away. The main living area has been updated not too long ago. The floors are the wooded tile style. There are 3 leather sofas and a fireplace. The kitchen is well equipped and has plenty of storage space. The main deck has an outdoor table with seating for 6 plus there are additional chairs. It also has a gas BBQ grill that is attached to the house's gas system. The master suite is huge and it has a gas fireplace. The lower level suite has a fireplace as well. There are 4 bathrooms in the house and they are all fairly large. The beds in the master and lower suite were fine. The beds in the loft were old and probably should be replaced. The WIFI in the house is only DSL but it was adequate. The grandson played his XBOX with his buddies back in Florida without a problem. There is a new cell tower across the mountain and if you have Version, you will have 4 bars of service. The road coming up to the cabin is paved but it is also wider than most mountain roads I have been on. Shopping is not an issue here either. There is a brand new super Ingles about 15 minutes away. There is also a Walmart and a BI-LO that are even closer. This is an older house that was built in the 1990's so some things may seem a little outdated, but it is well taken care of and extremely clean. You cannot find anything in this price range that can handle 6-8 people with this location and views in the Smokies. AGE RESTRICTIONS: MIN AGE 35 AND MUST BE STAYING AT THE HOME 25% DEPOSIT REQUIRED WITH RESERVATION. BALANCE DUE 14 DAYS PRIOR TO OCCUPANCY. MINIMUM BOOKING 3 NIGHTS, WITH EXCEPTION OF HOLIDAY WEEKS, WEEK BOOKINGS ONLY FOR THESE TIME-FRAMES (SEE ABOVE PERIODS) $150.00 CLEANING & STOCKING FEES ON ALL BOOKINGS ADDED $250.00 REFUNDABLE PROPERTY SECURITY DEPOSIT MAX. OCCUPANCY IS EIGHT (8) ONLY ONE (1) PET PER GROUP PERMITTED DOGS ACCEPTED - 35 LBS. MAX. - NEEDS TO BE DISCUSSED WITH OWNER IN ADVANCE.